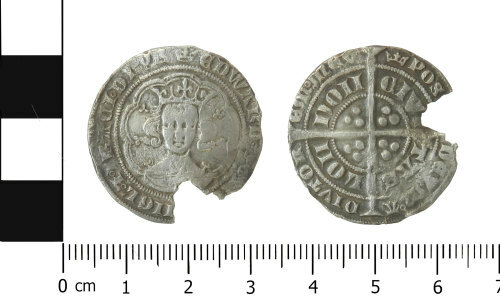 A silver groat of Edward III, (AD 1327-1377), of pre-treaty series F, fourth coinage. Reverse: POS[VI] DEVM ADIVTOREM MEV, CIVITAS LONDON; long cross dividing legends, three pellets in each quarter. The initial mark is a coronet, AD 1356. North no. 1174. Reverse description: Long cross dividing legends, three pellets in each quarter.